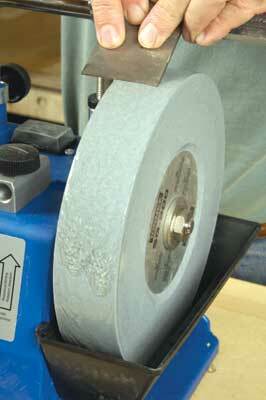 For me wet grinding is the only way to go and while a system like this one is dearer than a conventional grinder, it could pay for itself when put against the number of blades you could ruin. I have used the 2000 for a number of years. The 1200 is the baby of the range and offers a 200mm wheel against the 250mm of the larger models, along with 10mm less stone width. Tormek would argue that you don't need any bench stones and that you can sharpen as well as grind. Well, you can, but for furniture making I wouldn't recommend sharpening plane blades and chisels with it. Good set-up and use instructions are given in the accompanying book and DVD. Setting a blade into the straight-edge jig is simple, but once it is slid between the clamp pieces it must be tucked hard up against the two lugs on the right-hand side as you look at it, otherwise you will not get a square blade. Hold it tight against these as you tighten the two knobs on the clamp. The angle jig is easy to set up via dials. Wanting to grind a plane blade, I set the angle to 25 degrees, then slid the holder onto the main bar, rested the blade on the stone, set the jig on the stone, the left-hand resting on the stone and the right-hand foot on the blade, then adjusted the blade projection until it was level with the bottom of the right-hand foot of the jig. Then it was just a matter of keeping everything square and clamping up before grinding away. The great thing about these grinders is that they are easy to use accurately and give repeatable results, making maintenance of effective cutting angles easy. 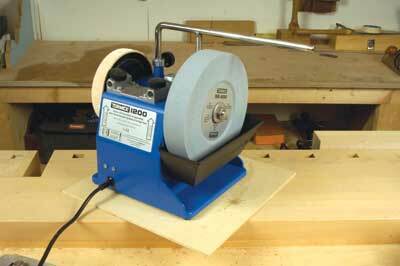 Numerous jigs for use with other tools are also available. This model should suit the occasional user well and for chisels and blades it's all you should need. "The great thing about these grinders is that they are easy to use accurately"
Make sure you have a "wet" area to use the grinder in - expect to get wet!